How does our house clearance service work? We usually just require 2-3 days notice, we like to turn up at 9am on the day of our appointment. If you are unable to be present during the house clearance we can pick keys up from solicitors, estate agents or neighbors. We will clear everything you ask us to clear, even the food from the cupboards, we can disconnect all white goods & uplift carpets if required. Note! 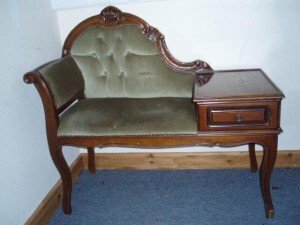 Items of sentimental or monetary value found during house clearance are handed back to each customer. 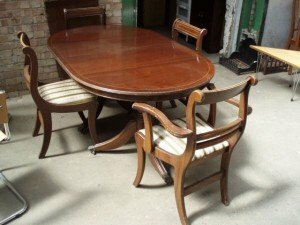 A large solid wood extendable oval dining table, together with six rounded back dining chairs. 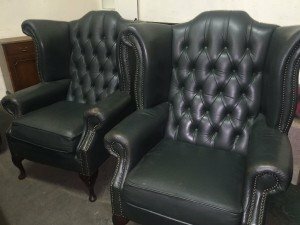 A pair of Chesterfield high back armchairs on mahogany legs, upholstered in bottle green leather. 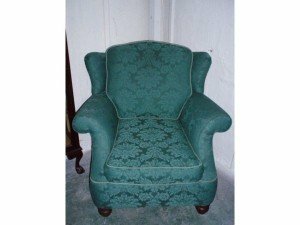 A vintage high back gentleman’s armchair on mahogany ball feet, upholstered in damask printed green satin. 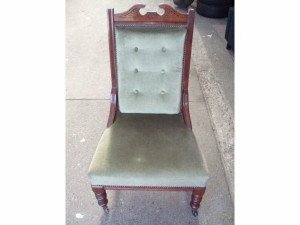 A mahogany carved high back vintage hall chair, upholstered in green velour with button detailing to the backrest. 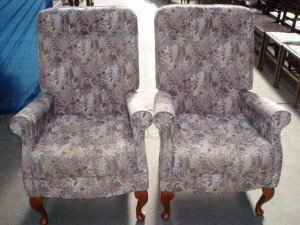 A pair of vintage high back armchairs on solid wood legs, upholstered in floral patterned fabric. 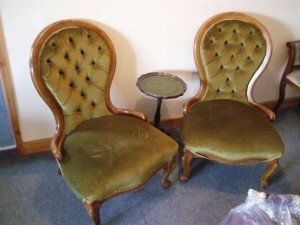 A vintage mahogany telephone table chair, carved to the back and upholstered in green velour. 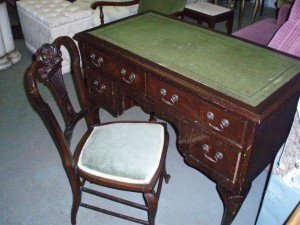 A vintage mahogany desk on paw feet, together with a matching chair upholstered in green velour. 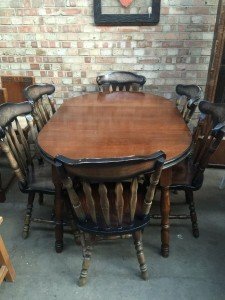 A vintage solid wood extendable oval dining table, together with four matching dining chairs, upholstered to the seats in striped patterned fabric. 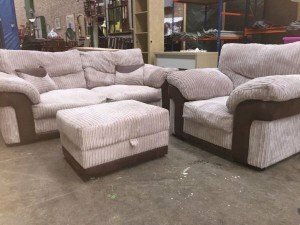 A three piece sofa suite, comprising of a two seater sofa, an armchair and a large storage footstool, upholstered in suede and grey cord velour. 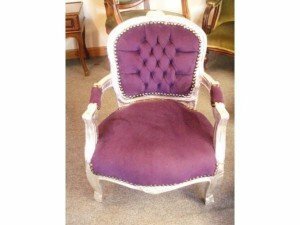 A small solid wood vintage armchair, upholstered in deep purple velour with brass studded detailing. 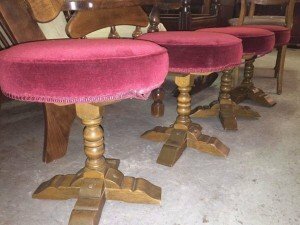 A pair of solid wood vintage spoon back nursing chairs, upholstered in free velour with button back detailing, together with a small mahogany side table. 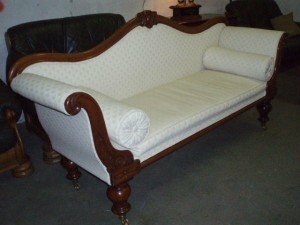 A heavily carved mahogany based chaise lounge sofa on castors, upholstered in cream satin. A set of four small solid wood barstools, the rounded seat upholstered in red velour. 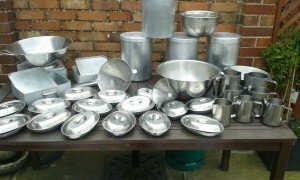 A large collection of stainless steel kitchen accessories, to include a large mixing bowl, a sieve, lidded pie dishes, milk jugs etc. 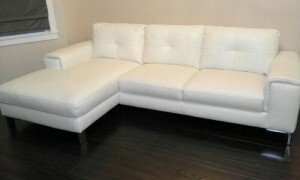 A large four seater low back contemporary sofa on a chrome base, upholstered in white authentic leather. 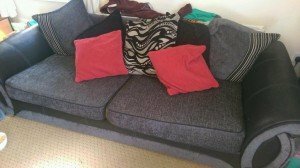 A large two seater low back sofa on wooden feet, upholstered in grey fabric with black leather inlay. 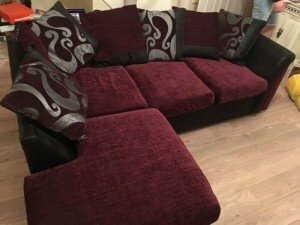 A large four seater low back corner sofa, upholstered to the base in black leather and maroon velour to the top. 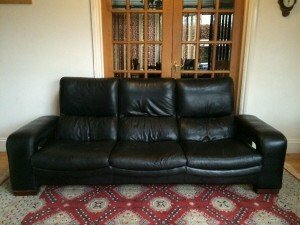 An art deco vintage three seater high back sofa on mahogany feet, upholstered in black authentic leather. 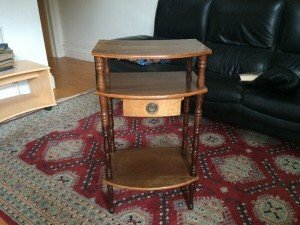 A vintage mahogany side table, having three shelves with a central small drawer. 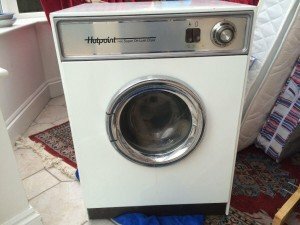 A white and stainless steel under counter hot point super deluxe dryer.